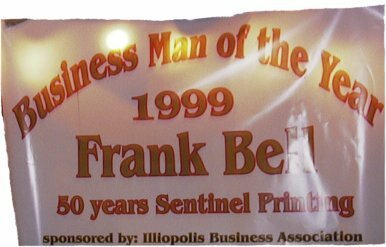 It is with great honor, that the Illiopolis Business Association awards its "Business Man of the Year" award to local Newspaper Publisher and Editor Frank J. Bell. 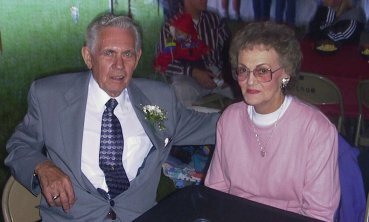 During his 50-plus years of service to the village of Illiopolis and Central Illinois, Frank has exemplified all that is good about our community. It is appropriate that the first Business Person of the Year award of the Illiopolis Business Association should go to the one person who has had more positive influence than any other single person in the last Fifty years. This is a photo of the special banner that the Illiopolis Business Association had made and hung in alumni tent for the special occasion. 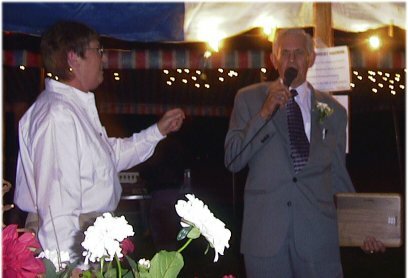 Frank Bell giving a short acceptance speech after receiving a plaque from Nancy Dale of the Illiopolis Business Association the Illiopolis Fall Fest on Saturday October 9, 1999.